Korea has an old vinegar culture dating back over a thousand years. While Korean vinegar history has been less thoroughly documented, especially in English, there are many references to recipes and processes for manufacturing of vinegar as well as culinary and medicinal uses. The Joseon Dynasty (1392-1897), was the period of the flowering of the Korean culture and the establishment of many of Korea’s modern traditions. 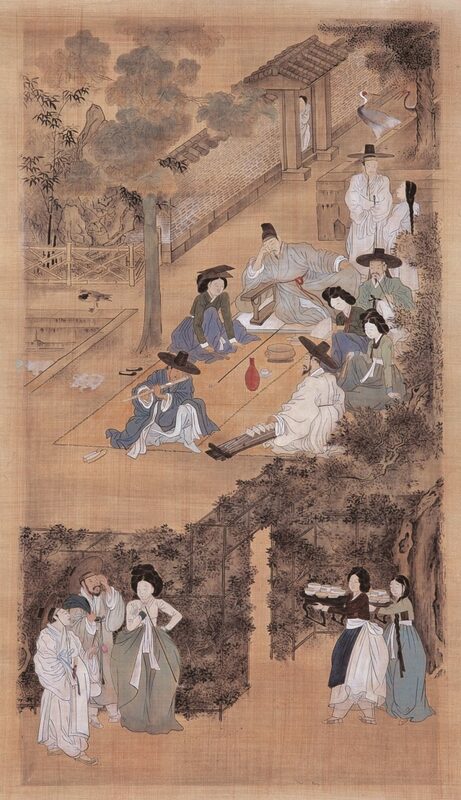 Korea, like Japan, was heavily influenced by China and scholarly works were written in Classical Chinese throughout East Asia similar to how Latin was used in Europe from the Renaissance through the Enlightenment. Joseon Dynasty cookbooks and medicinal treatises are replete with references to vinegar with many special varieties. Among the first of these, written in 1459, was SanGaYoRok (山家要錄). A thorough manual on agriculture, agricultural processing, and cooking SanGaYoRok describes 14 different types of vinegar from the traditional rice and barley to more exotic ones such as using iris flowers. Further writings such as SooEunJabBang ((需雲雜方) in 1504, ChalYoSeo (閨是議方) in 1670 and ChiSengYoRam (山林經濟) in 1715 further describe vinegar making including plum vinegar, jujube vinegar, and vinegars with names such as “Three Yellows” and “Thousand Miles”. Medical uses for vinegar were often suggested as in the DongEuiBoGam (東醫寶鑑)) of 1613. DongEuiBoGam recommended the topical use of vinegar against abscesses and insect bites and the oral use of vinegar to help cure dizziness and neutralize toxins in ingested foods. The most extensive writing known on vinegar in the Joseon Dynasty was the agricultural manual ImWonSipYukJi (林園十六志) in 1827 by Seo Yugu. Containing over 42 different vinegar recipes including those of rice, barley, jujube, peach, honey, and tangerine. Variations of many of these vinegars still exist in Korea as well as other popular vinegars such as those made from persimmons.